The World Championship returned to Silverstone after two years during which the British GP had been held at Aintree. The usual field was joined by a number of local drivers which included F1 debutantes Mike Hailwood in a Reg Parnell Lotus and Bob Anderson in a DW Racing Lola. There was no surprise to see Jim Clark at the front after qualifying. The Team Lotus driver qualified two-tenths faster than Dan Gurney's Brabham while the front row was completed by Graham Hill in the BRM 57 (the team having decided not to race the newer 61) and Jack Brabham's Brabham. The second row of the 4-3-4 grid featured John Surtees in the only Ferrari present and the two Cooper-Climaxes of Bruce McLaren and Tony Maggs. There was a huge crowd to watch the race but rather than seeing Clark take the lead as usual, they witnessed Brabham and Gurney go into the lead in the two Brabhams with McLaren and Hill also ahead of Clark. It did not last long and on lap four Clark was back in the lead again. As Clark pulled away from the rest, McLaren went out with engine trouble. Gurney overtook Brabham for second place and a few laps later Barbham's engine blew up. This promoted Hill to third place although he soon came under attack from Surtees. On lap 59 Gurney went out with engine failure and so Clark was left with a lead nearly a minute over Hill and Surtees. 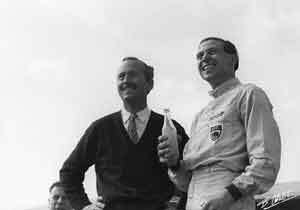 On the last lap Hill ran out of fuel which allowed Surtees to pass him and grab second place.